When Lockheed developed the L1049 Super Constellation, TWA enjoyed an advantage over other airlines, since the plane had the speed to allow non-stop transcontinental flights, and was faster than the DC-6 (TWA marketing people didn't think people would sit still for a non-stop trip, however, and insisted on a stop until American announced upcoming non-stop service with their new DC-7's!). To counter this threat from the Super Connie, American requested that Douglas develop a plane with the L1049's engines (Wright R-3350's). Douglas was doubtful that a plane like that would sell, so American ordered 25 for $40 million, to provide an incentive. American ended up owning 34 DC-7's, and sales were made exlcusively to domestic US operators which used them on transcontinental routes, since the DC-7 didn't have the range for transocean non-stops and thus would not be much improvement over the DC-6B. However, they were very successful in transcontinental service, since they were faster than the Super Constellations, and allowed American to advertise 8 hour non-stop service. Sales eventually totalled 105, with the owners being United (57), American (34), Delta (10), and National (4). However, Douglas went on to modify the DC-7 (with more fuel) to the DC-7B, and (with a lengthened fuselage and wings) to the DC-7C Seven Seas, and eventually sold a total of 338 of the DC-7 series, at a substantial profit. The DC-7's proved to be less reliable than the fabled DC-6B, and less economical as well. Thus, the DC-7's had a short stay in service with the major airlines, and were sold soon after the arrival of the jets. They worked for many years for 2nd tier airlines and as freighters or fire bombers, but most have been scrapped - suffering in comparison to arguably the best propliner ever, the DC-6B. High quality R-3350 DC-7 stereo sounds are available from Jon Jefferys. These are the best I've heard so far. They are designed to be used with the FS2004 slow engine startup. This package is downloaded separately; the base packs include a much smaller PropSound package. Last updated on 10/30/13. Update that reduces sound when engines are stopped. Last updated on 11/1/2013. To repaint this model you can use the Paint kit for GMAX DC-7's. 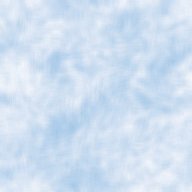 Contains layered PSD files (usable in both Photoshop and Paint Shop Pro) which allow you to place your paint scheme between the bare metal layers and the windows and doors. Makes for fast painting! Note: there are no actual painting instructions in the file; follow the detailed instructions in my Repainting Tutorial. Please read the included text file for details for each DC-7 model. FS2004/FSX United Air Lines DC-7 Base Pack. This great GMAX plane by Greg Pepper is painted in the "modern" United scheme common in the 1960's. These were also common in Sacramento when I was a kid, and it was always a special treat to see a DC-7 instead of the ubiquitous DC-6's. It features animated speed brakes (the main gear was used as a speed brake). Since we are a California page, I thought it would be appropriate to model the Mainliner Hollywood! It features FSAviator's great flight dynamics too! Now includes non-radar version and Polar Path Compass. Comes complete with KMCC DC-7 Panel and Prop Sounds! Last Updated on 12/28/17. FS2004/FSX American Air Lines DC-7. This is the plane that CR Smith wouldn't let Donald Douglas skip. Douglas wasn't sure that the DC-7 would sell, so CR bought 25 of them to seal the deal. They allowed American to fly nonstop across the USA. This one is (very appropriately) the Flagship California. Textures only -requires the UAL DC-7 Base Pack above. Last modified on 6/11/10. FS2004/FSX National Airlines DC-7. This National DC-7 that I've painted displays their "Airline of the Stars" livery, a very glamorous image indeed! The DC-7 was used for the major NAL routes, such as Miami-New York. It was eventually replaced by DC-8's, keeping the Douglas tradition alive at National (although National also tried Super Connies in the 50's, using them in coach service). National also used DC-7's on the premier service with American and Delta from Miami to Los Angeles and San Francisco, "The Tradewind". Textures only -requires the UAL DC-7 Base Pack above. Last modified on 6/11/10. FS2004/FSX United Air Lines DC-7. Jim "Hornit" Campisi has painted up this later variation of the United jet delivery scheme, without the logo above the windows and the reg number on the fuselage. A great job - thanks! Textures only -requires the UAL DC-7 Base Pack above. Last updated on 3/6/13. Texture fix. Last updated 3/16/13. FS2004/FSX United Air Lines DC-7. Eric Joiner has painted the new DC-7 into the original colors it wore at United. Use only the textures from this package - requires the UAL DC-7 Base Pack above. Thanks!! Last updated on 6/11/10. 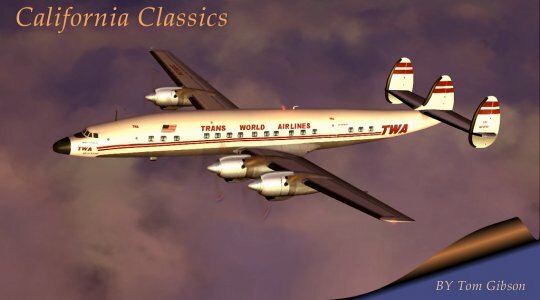 FS2004/FSX Delta Air Lines DC-7. Here's a DC-7 that Jim Campisi has painted into the conservative colors of Delta Air Lines. Delta really liked the '7, and used them into the late 60's. They were commonly seen in California on interchange services with American and National. Use only the textures from this package - requires the UAL DC-7 Base Pack above. Last updated on 3/14/05.